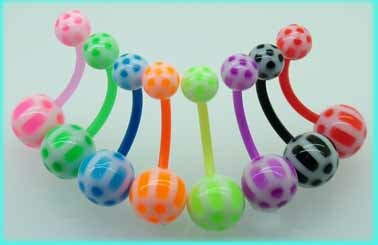 Belly bars with UV glow balls and glow in the dark belly bars with flexible bars. 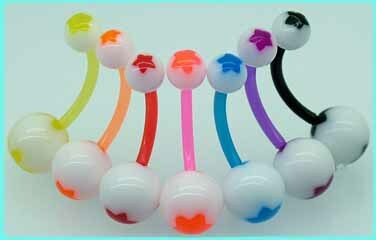 Belly bars with UV glow or glow in the dark balls and flexible acrylic bars, hundreds of UV glow belly bar designs. Please have a look at our pregancy belly button bars page if you are looking for flexible belly bars to be worn during pregnancy. 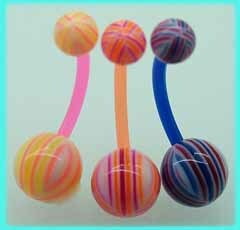 These 1.6mm x 10mm plastic belly bars have beach ball design balls and are available in either red/blue, purple/pink, black/red, blue/green, orange/cerise, purple/green. These 1.6mm x 10mm acrylic belly button bars have butterfly design balls and are available in white, green, red, blue, black, yellow, pink and purple. Please select the colour that you require. These flexible 1.6mm x 10mm acrylic belly bars have pearlised effect, plastic balls and are available in yellow, green, orange, purple, blue, dark blue and charcoal. 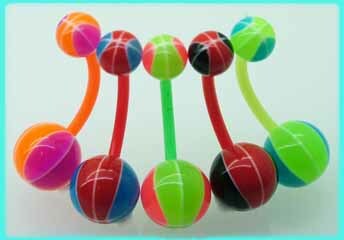 These 10mm acrylic belly bars have beach ball design, UV glow balls and are available in orange, lime, pink, black, red, white and blue. 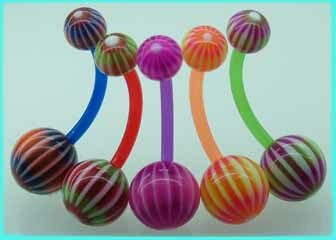 These 1.6mm x 10mm acrylic belly bars have striped, UV glow balls and are available in blue, red, purple, orange and green. 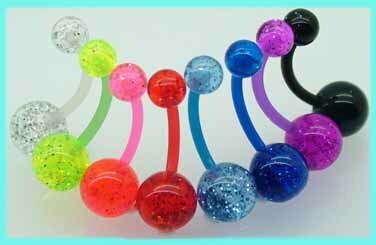 These 10mm acrylic belly bars have ball design, UV glow balls and are available in pink, green, blue, orange, lime, purple, black and red. These 10mm acrylic belly bars have beach ball design, UV glow balls and are available in white, lime, green, orange, pink, red, purple, dark purple, blue and black. These 10mm acrylic bars have windmill design, UV glow balls and are available in bright blue, orange, purple, red, dark blue and black. 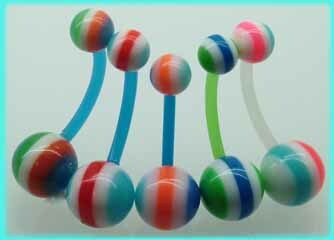 These 10mm acrylic bars have spiders web design balls and are available in green, white, red, orange, lime, pink, black and purple. These 10mm acrylic belly bars have plain acrylic balls and are available in red, yellow, clear, dark blue, pink, light blue and black. These 10mm acrylic belly bars have star design, UV glow balls and are available in yellow/black, aqua/white, red/black, blue/red, blue/black and black/pink. 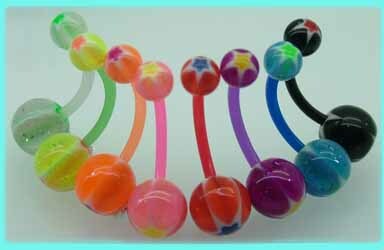 These 10mm acrylic belly bars have star design, UV glow balls and are available in white, yellow, orange, pink, red, purple, blue and black. These 10mm acrylic belly bars have star design, UV glow balls and are available in black, white or blue. 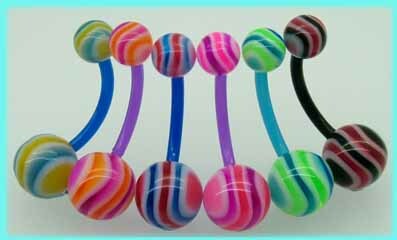 These 10mm acrylic belly bars have beach ball design, UV glow balls and are available in green, orange, red, blue, purple or black. 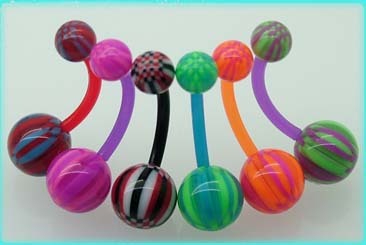 These 10mm acrylic belly bars have striped, UV glow balls and are available in pink, orange and blue. These 10mm acrylic belly bars have star design, UV glow balls and are available in green, red, purple, blue and black. 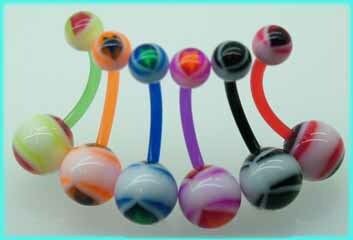 These 10mm acrylic belly button bars have patterned, UV glow balls and are available in yellow, orange, red, pink, blue, purple and black. These 10mm acrylic belly bars have heart design, UV glow balls and are available in purple, pink, green, black, lime and red. These 10mm acrylic belly bars have glow in the dark balls and are available in yellow, dark blue, white, red, purple and light blue. These 10mm acrylic belly bars have striped, UV glow balls and are available in purple, blue, green and black. These 10mm acrylic belly bars have chequered design, UV glow balls and are available in white, orange, purple, blue and black. These 10mm acrylic belly bars have cats eye effect balls and are available in red, black, pink, blue, white, purple and yellow. These 10mm acrylic belly bars have patterned, UV glow balls and are available in green, orange, blue, purple, black or red. These 10mm acrylic belly bars have striped, UV glow balls and are available in orange, red, green, red/black and green/blue. 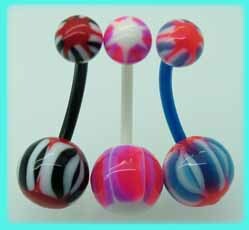 These 10mm acrylic belly bars have striped, glow in the dark balls and are available in purple or blue. 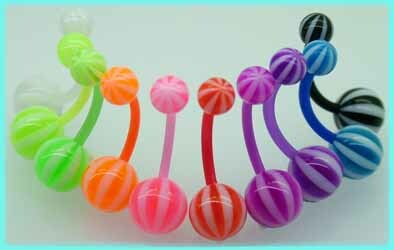 These 10mm acrylic belly bars have beach ball design, UV glow balls and are available in orange, purple, blue, green and black. 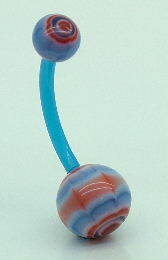 This is a 10mm bright blue acrylic navel bar with brown, white and blue patterned,acrylic balls. 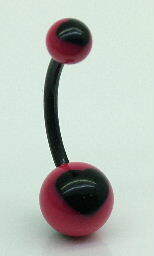 This is a 10mm red acrylic navel bar with red, grey and black patterned UV glow balls. 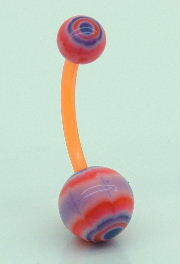 This is a 10mm orange acrylic navel bar with patterned acrylic balls. 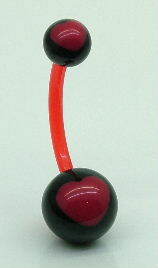 This is a 10mm acrylic belly button bar with red and black, heart design balls. 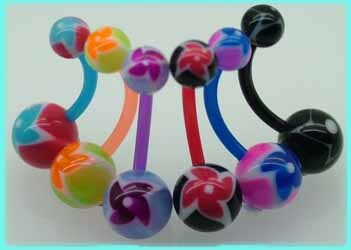 This is a 10mm flexi belly bar with acrylic heart design balls. 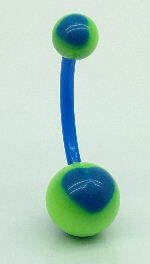 This is a 10mm flexible belly bar with blue and green, heart design balls. 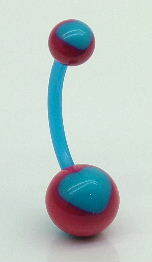 This is a 10mm bright blue flexible belly bar with bright blue and red, heart design balls. 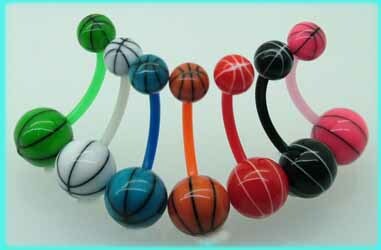 This is a 10mm flexible navel bar with black and white, UV glow balls. 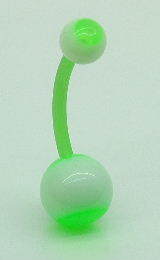 This is a 10mm flexible navel bar with green and white, UV glow balls. 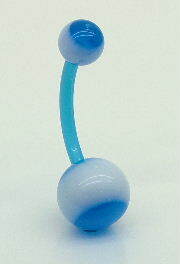 This is a 10mm flexible navel bar with blue and white, UV glow balls. 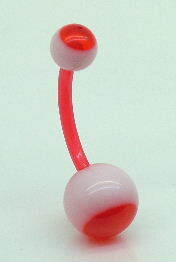 This is a 10mm flexible navel bar with red and white, UV glow balls. Pregnancy Belly Bars and flexible body jewellery for maternity wear. Our Bio-Flex navel bars are great to wear whilst pregnant.